Erin Tonkon is a true twenty first century producer at the intersection of the legacy of rock & roll and the future of modern music. A graduate have The Clive Davis Institute of Recorded Music, Erin has experience in many aspects of the music industry, but found her home in the recording studio. 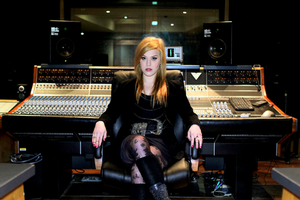 She began working full time as engineer and production assistant for legendary Producer Tony Visconti’s full in May of 2013. With Visconti, Erin worked with such artists as David Bowie, Esperanza Spalding, Daphne Guinness, The Foo Fighters and Kristeen Young. She continues to work for Visconti as she launches her own production company, Tonkon Productions. Erin is currently working on the debut release of the Brooklyn based band One Prayer One Sin. As an engineer and producer, Erin helps artists to find their strengths in the studio by drawing upon her experience with some of rock music's legends. She creates sounds that have all the visceral rawness of classic rock, only with a twist-- expertise and immersion in new technology.